After another blockbuster round of the Six Nations, we pick our team of the week. Ireland claimed a 9 point victory over error-ridden Scottish side at Murrayfield on Saturday before Italy pushed a second-string Wales side all the way later that day. On Sunday England breezed to fantastic 44-8 victory over France. Understandably England has more players featuring in our team of the week while Italian claimed a spot. The hard-working Irish veteran claims the first place in our team of the week with his opposite number Allan Dell making a strong claim for a place in the side. Mako Vunipola potentially could have snuck into the side had he not left the field so early in England's victory but in the end Healy takes it. The Irishman hardly put a foot wrong all game against Scotland and got around the pitch making his presence felt on attack and defence. It's hard to see how Dylan Hartley can reclaim the starting #2 jersey from Jamie George after yet another solid performance for England. Just one of his lineout throws did not hit his jumper while he provided England with another strong ball carrier out wide and around the fringes. Ireland's Rory Best came closest to the England front rower in what was an off weekend for the other hookers in the competition. Lee bossed Italian scrum and was one of the standout performers in a rather unconvincing win for Wales. He carried strongly and was dominant in everything he did. Tadgh Furlong and Kyle Sinckler are both unlucky to miss out to the big Welshman. Massively repaid Eddie Jones' faith in him after Maro Itoje's injury. Lawes laid into the French pack with some massive hits and even landed one on the imposing frame of Mathieu Bastareaud. He was just as effective on attack making 10 carries and was a great lineout option. Scotland's Grant Gilchrist also had a massive shift against Ireland making 25 tackles while Quinn Roux impressed on his Six Nations debut. A workmanlike performance from the young second rower has become somewhat of a norm that it is often overlooked. Ryan was massive on attack and defence against Scotland as well as being aggressive in the rucks. He made 15 carries and 15 tackles without missing a single tackle. Jonny Gray, like Grant Gilchrist, put in a massive defensive shift while George Kruis was effective against France. Thrived in a physical encounter against Scotland on Saturday and was potent as ever in the rucks and disrupting Scotland's mauls. Tackled and carried well and his efforts were rewarded with the man of the match accolade. Mark Wilson's performance against France can not go unmentioned as he piled up the tackle count once again and did plenty of work in the trenches. 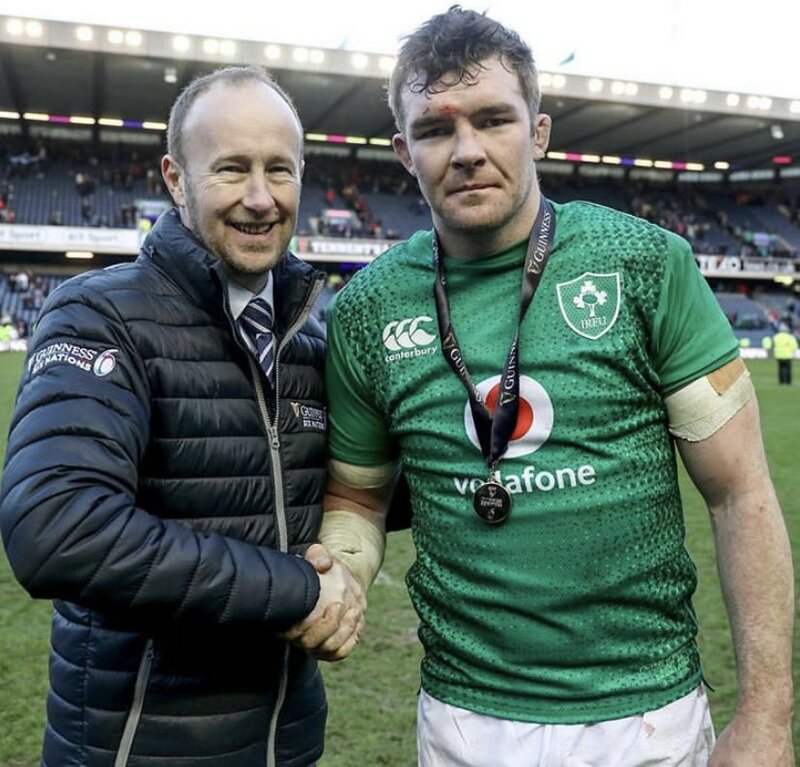 An extremely tough decision this week for the #7 jersey with Sean O'Brien, Thomas Young and Tom Curry all having truly outstanding games and could quite easily have claimed the jersey. In the end, we have given the jersey to Italy's Braam Steyn who well and truly deserves it. He was incredible against Wales in all facets of the game. He was all over the pitch making 16 tackles and 11 carries while also picking off a number of Wales' lineouts. His work at the breakdown was just as impressive while he was also rewarded with a try. Louis Picamoles battled through 80 minutes at Twickenham while Billy Vunipola was destructive in his 64 minutes but the #8 jersey goes to Scotland's hard-working loose forward Josh Strauss. There was hardly a blade of grass on Murrayfield that Strauss' boots did not touch as the 32-year-old made 25 tackles and 17 carries. Strauss set the tone of his performance with a big carry to bounce Bundee Aki off and carried on in that fashion from there. Finaly, Josh Navidi put in hefty shift at no.8 for Wales. A much-improved performance from the Irishman who struggled against England last week. His kicking and passing game was a lot crisper and he was in the right place at the right time to pounce on Tommy Seymour's error to score. Ben Youngs had another strong game for England while Antoine Dupont made a noticeable improvement on France's performance. A stellar performance from the England captain sees him claim the #10 jersey. Farrell put in some outstanding kicks that caught France napping. He controlled the game superbly and could easily have been named man of the match had Jonny May claimed a hat-trick. Finn Russell came up with some moments of magic against Ireland with Joey Carbery doing the same. May benefitted from some stellar attacking play from his teammates and a few French weakness in defence but his was clinical enough to finish off all the opportunities that came his way. He was also strong defensively and chased kicks brilliantly. Elsewhere, Jacob Stockdale put in a fine performance for Ireland. Rampaged the French defence with strong ball carries off the shoulder of Owen Farrell and linked up with his fellow backs. Tuilagi was brutally effective for just over an hour and beats Bundee Aki and Owen Watkin to a place in the side. Slade has quickly silenced his doubters with two outstanding performances in a row. He was lethal against France and was involved in two of England's tries. Slade was effective in the air and was just as good as a kicking option. He also managed to keep Bastareaud relatively quiet. Chris Farrell was solid on his return to the Ireland starting line up while Jonathan Davies was good against Italy. Adams lined up on the left wing for Wales but makes our team on the right wing after a superb outing against Italy. Adams was Wales' most dangerous attacking weapon. He regularly gave Wales front football and used his lethal hand off to beat off defenders. His was rewarded with a second-half try. Keith Earls narrowly misses out to the young Welshman. Kearney showed exactly what Ireland were missing in their clash against England, with an outstanding performance against Scotland. He covered the backfield with regular ease and looked calm and collected throughout the game. He also joined the attack at the right time to rack up 88 running metres beating 5 defenders and claiming 3 clean breaks. Blair Kinghorn was excellent in replacing Stuart Hogg while Elliot Daly was solid against France.